Share this resource with your social network! Increasing student engagement and achievement, developing students as lifelong learners, preparing students for college and careers, and reducing inequities are common goals in schools across the US -- and, we know, are ones not easy to accomplish. But that does not mean they are impossible - many educators, administrators, researchers, and experts agree that, when done well, personalized learning makes a significant difference for students. While we recognize that personalized learning is, in many ways, good teaching amplified, there is no shortage of detailed, in-the-weeds as well as big picture questions about the implementation, the key elements, and the measures of success of personalized learning. But navigating all the information out there is challenging and it is often hard to find exact answers. Based on our experience working with over 750 schools and 140 districts across the US., we have created this guide to provide a curated set of resources and literature about how personalized learning is most effectively applied in K-12 settings, alongside many of the tools and resources that we have internally developed to help our district partners launch, implement and sustain personalized learning. Tools, frameworks, guides, reports, videos, case studies and white papers that can help you in your personalized learning journey, whether you're considering it, launching it, supporting it, sustaining it or scaling it in your school or district. Click on any chapter to scroll directly to it. Join a community of 750 district and school leaders, personalized learning practitioners, and national experts for two+ days of connections, collaboration, and learning as we focus on building networks and transforming education. Across the country, personalized learning is increasingly recognized as a promising strategy to close achievement gaps, increase student engagement, and prepare students as they become self-directed, lifelong learners by meeting their individual needs. While no single definition of personalized learning exists, the many definitions from leading experts share common general principles that include student voice and choice, customization to each student’s strengths and needs, student agency, and flexibility of instruction. U.S. Department of Education: Personalized learning refers to instruction in which the pace of learning and the instructional approach are optimized for the needs of each learner. Learning objectives, instructional approaches, and instructional content (and its sequencing) may all vary based on learner needs. In addition, learning activities are made available that are meaningful and relevant to learners, driven by their interests and often self-initiated. Digital Promise: Personalized learning, learning that is connected to each individual’s development, background, interests, and experiences, provides an approach that broadly and equitably supports educators’ efforts to empower learners as individuals. In many ways, the principles of personalized learning stand in stark contrast with traditional classrooms: with the teacher’s guidance, students in personalized learning classrooms move at their own pace, pursue learning that aligns with their individual interests, and set goals to reach their potential. While the sheer number of districts that are starting to consider how to redesign classroom environments and include these principles is promising, the shift to personalized learning leaves many educators with many important and unanswered questions. You will find many of these below. We don’t need a model of superhuman superhero teachers. We need to use the power of technology and educational design—combined with the high aspirations we all begin with—in order to create innovative learning environments that foster personalized learning for everyone. 1- WHY DOES PERSONALIZED LEARNING MATTER? The story of the young child who wasn’t yet meeting age-appropriate development milestones by age two; he wasn’t talking yet. The parents were nervous and frustrated, but a teacher recognized that a different approach (baby sign language) could be particularly helpful. The child thrived and had so much to say. The student who was regularly bored in math because it was too easy, so he daydreamed about other things. A teacher noticed and gave him new materials to study - different from the rest of the class - and new skills to learn. Eventually he grew up to teach middle school math. A fourteen-year-old who was frequently disruptive and often sent to the principal’s office. A teacher recognized that the student was reading at the first-grade level, so she provided targeted small group instruction to help her student develop skills in reading. Not suprising, the student's behavior, attitude, and academic success improved immensely. When it happens for us – when someone personalizes for us, or a loved one – we know how valuable it can be. Personalized learning promotes student agency - We know from the science of learning that student ownership and agency promotes learning. We also hear consistently from employers that they look for people who are self-directed. And so, we need to guide students to set their goals and work to achieve them, as well as give them choices so they learn how to make their own decisions. Personalized learning creates lifelong learners - Our world is ever changing; and challenges will continue to present themselves and evolve. So students cannot simply learn speciific solutions, but must be prepared to learn how to learn. Personalized learning increases student engagement - A recent gallup poll shows that as students get older, they become increasingly less engaged in typical schools. Personalized learning shifts this in two ways: through making meaningful connections between teachers and students we increase student engagement, and through making learning more relevant we make it more engaging too. Personalized learning increases student achievement –Through personalized learning, students spend more time in their zone of proximal development and teachers spend more time addressing the needs of each student. With increased understanding of the types of supports students need, teachers can provide more targeted instruction and support, students are more actively engaged, resulting in higher student achievement. Personalized learning is what our students deserve - Students deserve equitable opportunities and supports to be successful and realize their fullest potential; they deserve opportunities to bring their whole selves to the learning experience. As iNACOL's 2018 report Designing for Equity notes - "Personalized and competency-based systems have the ability to empower individuals and enable educators to disrupt the historical dynamic of sorting students, and replace it with one that seeks to educate 100 percent of students." Personalized learning is the future of learning - And this is what they said about it All Things Considered: The Future of Learning? Well, it's Personal! Interested to know what parents think? Check out this article: Why Personalized Learning? A Parent’s Perspective. 2- WHAT ARE THE BENEFITS OF PERSONALIZED LEARNING? Decades of research have shown the benefits of personalization and differentiation. And, while the term may feel like a fad, personalized learning is about good teaching strategies that have been in classrooms for decades. More efficient and effective learning: According to iNACOL’s definition of personalized learning, students’ educational experiences are shaped by their strengths, needs, and interests and instruction is tailored to their needs. Students receive the content they need to master, without having to sit through content they already know. Every student is unique and special (see also Todd Rose’s End of Average) and personalized learning takes that fully in consideration: It doesn’t slow down students who are gifted, and doesn't rush students struggling to keep up with the rhythm. It doesn’t simply group all students in the middle with a one-size-fits-all model, but instead meets each student where they are. And this is so much more efficient and effective than a model in which while trying to meet everyone, we actually miss almost everyone. When students spend more time in their Zone of Proximal Development (ZPD) learning is more effective and efficient. And when learning is more effective and efficient, students can both learn more and go deeper. More time for teachers to focus on each student: Instructional models centered around personalized learning provide time for teachers to focus on each student in different ways. In a project-based model, for example, teachers spend time understanding student interests as they help develop areas to study or projects to consider. In one-on-one tutoring, teachers/tutors get to know the needs of each student they support by doing things like reviewing their past work and working together on current assignments. And in blended learning – the path many of our district partners choose – teachers often use time and space differently to give students more time for small group or individual work. Above all, in these personalized learning environments, teachers know their students better and have time to address each particular student’s needs. These models allow for the delivery of targeted intervention to and acceleration of specific students. Teachers are enabled and empowered to give one-on-one attention to the students who need it most. More student-centered and engaging: Tailored to the individual needs, skills, and interests of students, personalized learning enables students to take ownership of their learning. Students feel happier about the learning process. The classroom becomes a space for discovery and joy; school becomes a place where they want to be, and courses become enjoyable challenges in which they want to engage. This leads to so many amazing things. Students develop into lifelong learners when we engage them early and often. We can empower them to set and achieve their own goals; we can help them to chart their own paths. And when they do all of this, they also almost always achieve more. More prepared for college, career, and citizenship: The industrial era is over. We cannot teach our students the way we have been taught. The traditional model of education, born in the industrial age with a one-size-fits-all approach, does not meet the needs of our modern economy. Personalized learning gives our students a personalized educational experience “that equips them with the skills, values, characteristics, and knowledge they need to thrive in our modern society” (Industrial Age Education Is a Disservice to Students). Today information is easily accessible, but what we do with it, how we use it and how we apply it is the challenge. We do not need to teach our students to memorize facts, we need to teach them to use facts to solve problems. So the focus of our classrooms needs to change. What we want to teach and how we teach needs to be better suited to the world of work our students will enter. And personalized learning enables us to do this. It gives us a new approach to teaching that better prepares students for the connected age in which we now live. Enlarged City School District of Middletown, NY - Middletown wanted to close a persistent achievement gap between white and minority students, between students in and out of poverty. Yuma Elementary School District, AZ - For ten consecutive years, Yuma faced declining enrollment. The district wanted to be the premier district in their area to provide innovative programs, districtwide technology, and personalized instructional models to meet the needs of their students. Syracuse City School District, NY - Syracuse wanted to improve student engagement, achievement, and support social-emotional learning. Loudoun County Schools, VA - Loudoun County Public Schools was determined to prepare students for success in a global work environment. By aligning project-based learning and personalized learning initiatives, and focusing on implementation, they feel that they are creating future ready students. Fairbanks North Star Borough, AK - Despite facing the unique challenges of being an isolated, rural community, the Fairbanks North Star Borough School District in Alaska committed themselves to preparing students for 21st-century technology and careers. Making the case for personalized learning? 3- CAN PERSONALIZED LEARNING SUPPORT EDUCATIONAL EQUITY? Personalized learning can be a powerful tool for educators seeking to provide equitable outcomes for students. Equity can be the driver that empowers PL tactics and associated instructional models in our efforts to provide all students equitable access to not only grade-level content and skills but also equitable opportunities to achieve their very best. Having said that, equity is not an inherent part of PL. The teacher who personalizes learning experiences for students must be the one who actively applies an equity lens to their work. Simply using a station-rotation model will not automatically lead to more equitable outcomes for students. Educators and educational leaders engaged in this work must intentionally use an equity lens to give driving purpose to personalizing learning for students. This, in turn, influences how we use personalized learning frameworks and instructional practices, as well as how educators and students perceive this work. How Can Personalized Learning Support Educational Equity? 1- WHAT ARE THE RISKS TO AVOID WHEN IMPLEMENTING PERSONALIZED LEARNING? Without fail, one of the first questions district leadership teams ask us is, “What have other districts done that we should avoid?”. Risk #1: Lack of Clear Vision, Narrative, and Rationale: Many districts struggle to paint a clear picture of how personalized learning looks different from what happens in classrooms today. Instead, they turn to educational jargon and say things like, “we want to see 21st-century skills and higher-order thinking skills.” Sounds great, right? But if I’m a teacher, I don’t know what I should be doing differently. Or if I’m a parent, I don’t know how my child’s experience will be different – much less improved – than before. And while school leaders and teachers may understand that they are being asked to focus on different instructional strategies, such as more small group instruction or flipped teaching, they may not be able to articulate why they are taking these new approaches. Without a clear vision and narrative, district leaders have trouble identifying early wins or proof points of success that would help them increase buy-in and offer exemplars of good practice. Risk #2: Curricular and Instructional Misalignment: Many districts do not spend the appropriate time sufficiently and early in the process to make sure that new instructional models and content align with the district’s current curriculum or instructional frameworks. Often, district curriculum coaches and school-based instructional coaches are missing from initial conversations around planning, design, and professional development. As a result, school leaders and teachers are unclear on expectations and how the new instructional model “fits in” with what they were already doing – for example, what does differentiation look like in a personalized system? The lack of clarity can often lead to a compliance mindset among school leaders and teachers. Schools that adopt a compliance mindset often put a new label on current practices -- “we’re already doing this, we just need to call it something different” -- rather than embracing the opportunity to go beyond current practices. Schools that adopt a compliance mindset also frequently miss the opportunity to increase student choice, to offer additional pathways for student learning based on need, or to rethink how to personalize their professional development for teachers. Risk #3: Failure to Build Capacity at District and School Level: Many districts create a rollout plan that only involves the principal in the periphery. For example, they allow teachers to opt-into personalized learning but have no expectations for the principal’s involvement. It’s hard for changes to stick at a school if the leader is not involved! Some districts also fail to build internal capacity at the district level to communicate, coordinate, or support the work. For example, they defer to vendors or consultants to fully own the messaging and delivery of training and do not build district capacity to support work. As a result, the district may have a few shining stars at the classroom level, but limited examples of excellent, whole-school shifts to personalization. Furthermore, once the vendors or consultants leave, there is no one with the capacity or experience to continue the work. Risk #4: Starting with the Wrong Schools: We often see districts begin rolling out personalized learning in schools or grade levels that may not be ready for the change. The decisions are sometimes made due to political or funding pressures. District leaders may feel pressured to start at the high school level to fix low engagement or poor academic results. They may worry that parents and community members will object to providing elementary school students with additional devices or technology before high schoolers when in fact, elementary school is a great place to begin personalized learning! Additionally, we often see investment in personalized learning – technology, professional development, coaching positions, or design services – directed by the availability of grants for turnaround schools. We strongly believe personalized learning is the right approach for all students, and have seen great success in turnaround schools. However, turnaround schools sometimes do not have the appropriate culture or staffing to sustain the change that personalized learning requires. By starting personalized learning in places where it may take a long time to see success, district and school leaders may be unable to identify early wins that would help them increase buy-in across the district and with parents and school board. Risk #5: Under-communication with Stakeholders: Districts often fail to create a strategic communications plan to ensure their stakeholders hear the right message about personalization. A district may initially communicate their plan with families, the school board, and journalists, but they fail to follow up with subsequent messages or venues for discussion. Lack of a communications plan can have many implications. Families may only hear about the infusion of technology into classrooms, not the pedagogical changes, and think that students are not getting sufficient instruction from teachers – “teachers aren’t doing their job!” Many times the school board does not understand the criteria by which the district will measure the success of the work. They do not know the difference between “this is not working” and “this just takes more time,” and withdraw their support. We’ve also seen instances where journalists are not provided with consistent information about the rollout, and therefore write stories with inaccurate information or cover schools with poor implementations. These messages get amplified and make it more difficult to scale and invest in future transformational work. Risk #6: Selecting the Wrong Devices: We’ve saved this risk for last because it’s one of the most talked about. Poor device decisions often attract the most publicity, and for that reason, districts have a laser-like focus on device selection – a critical decision for sure, but we want to make sure this risk doesn’t overshadow the others on the list. Districts often run into problems when they don’t have an adequate process to select devices and thus encounter significant issues once devices are deployed to students. A district may not consider software compatibility with devices, nor how the device supports stated instructional goals. A district may not check references for devices, and as a result, experience significant breakage. Finally, a district may not have a plan in place to support selected devices, both technically and financially, which can result in unusable devices stacked in hallways and offices. Talk about a PR nightmare! 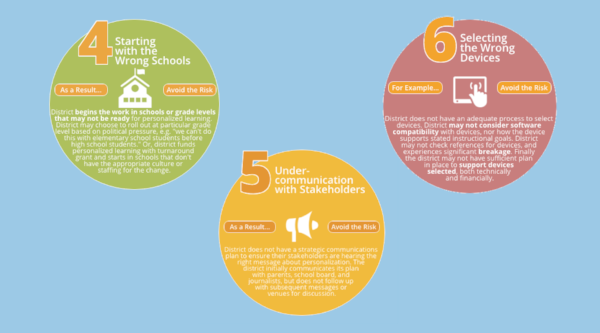 To learn more about these risks, and most importantly, how to avoid them, you can check out and download our infographic on the Six Personalized Learning Risks for School Districts and How to Avoid Them. 2- HOW DO YOU START IMPLEMENTING PERSONALIZED LEARNING? Whether you’re a district leader making the shift to personalized learning across your whole district, or you’re a teacher shifting your classroom, it is difficult to know what to do first. There are so many unknowns, and so many questions, mainly: How do I start? And where do I start? The answer? It depends. Each district is unique, with its own challenges, its own experience, and its own factors and community. But we can always rely on best practices based on our experience working with over 750 schools and 140 districts across the US. Some of our district partners shared their experiences around starting their personalized learning journey. First, seek out local and national organizations that are doing work around personalized learning and find out what resources they have that can help your district implement your vision. Second, expand your network of leaders in the district and value the collaborative process necessary for implementing a personalized learning vision. Personalized Learning Journey Begins with a Vision (Loudoun County Schools, VA): When you are going through a large amount of change and such a significant paradigm shift in educational pedagogy, the culture and the relationships within the organization must be strong and nurturing. As a leader, you must be willing to be vulnerable with your staff and to celebrate and highlight risk-taking, the act of being willing to try. It is in the trying, the multiple attempts, and the revisions that you can start to see PL taking shape in your classrooms. Building momentum and leadership at the same time is important (Yuma, AZ): Teachers are the key to implementing personalized learning and building momentum with district and site goals. They need the right amount of support and guidance to be able to move forward with new ideas. It is important to build leadership teams that will be fully dedicated to supporting all personalized learning agents on site to further develop leadership and momentum. Districts should focus on training their teams on their personalized learning vision and implementation, in addition to creating regular training focused on leadership development and capacity building. If you’re a teacher, you may be thinking about your classroom design, what tools and curriculum you will be using, and how you will be managing the students and allocating time to each one of them. All of these are real concerns, but before getting to those questions, the most important and first step to personalize learning, is knowing your students. Knowing your students, consider this tool for the first 20 days. And in this post, How to Make the Most of the First 20 Days of Personalized Learning, you will find an overview of how this tool is set up, to help you make the most of your initial steps. Administrators should also consider clear parameters to roll-out personalized learning within their districts. Check out this infographic on Design Parameters, and its related blog post Design Parameters for Personalized Learning. But whether you are a teacher, principal or district leader, you don’t have to go it alone. We created a Personalized Learning Toolkit for schools and districts that want to make the shift to student-centered learning on their own. The Personalized Learning Toolkit also allows designing sustained professional development that shifts teacher practice over time. Researched and tested activities based on the same Education Elements framework and methodology that has launched personalized models in over 750 schools across 140 districts. One leader of instructional technology told us that the old Do-It-Yourself way had been too time-consuming – he had been trying to go from nothing to something, a task which required a significant investment of time. With the Personalized Learning Toolkit, the materials are 98% all the way there. In turn, his focus has quickly gone beyond research and explaining the history of personalized learning, to how to successfully change instructional practice. Learn about our proven approach used with more than 750 schools and 140 districts, to implement personalized learning successfully at the district and school level. Every time we sit down with a superintendent, CTO, CAO, teacher, principal, coach, board member, or dean to discuss their goals for personalized learning, they always want to know: “Where should we start? What should we learn from other districts' mistakes? What should we focus on next?” After answering these questions multiple times, we started keeping a list. We saw that if a district lacked a clear vision for personalized learning, schools and staff wouldn’t understand the rationale behind the initiative. Likewise, if there wasn’t a culture of innovation present, it was difficult to build ownership and sustain excitement and support. Even things like budgeting and staffing became major issues if districts did not account for how they might need to shift in this new, personalized environment. We took this list of lessons learned and came up with a Personalized Learning Implementation Framework (aka, our PL Framework or our “bingo board”) with five key categories, and five focus areas in each category. We use these 25 focus areas for implementing personalized learning to guide our work at both the school and district level and to help school systems identify strengths, areas of need, and potential roadblocks. This personalized learning implementation framework has been helpful to district leaders at all stages of the implementation process. For district leaders just starting their journey, the framework has given them clarity on priorities. For district leaders who have been moving towards personalized learning for several years, the framework serves as a check to make sure they haven’t lost sight of essential building blocks and gives them guidance around what to do next. In this personalized learning implementation framework white paper, you will find specific examples of how the framework has been and can be used. 1- WHAT ARE THE KEY ELEMENTS OF PERSONALIZED LEARNING? At Education Elements, we have established our own key elements of personalized learning, called the Core Four Elements of Personalized Learning – elements that can lead to a successful personalized learning classroom. These elements - adopted as is, or modified by individual districts - can guide educators in creating a winning strategy for their district, schools, and classrooms. "The Core Four has provided a framework for our district in our implementation year for personalized learning. We were able to provide professional development around each of the Core Four areas to increase our teachers' understanding regarding how to personalize learning for our students. We will continue to plan for deeper understanding and improved implementation as we move forward on our PL journey." To provide actionable ideas and insights from districts which have successfully implemented personalized learning using the Core Four Elements of PL, we created the white paper, The Core Four of Personalized Learning, which includes a framework that can help you get started or take the next step – for your whole district or within your own classroom. The white paper provides guidance on how to clearly communicate to your stakeholders the specific ways that instruction will change in a personalized learning environment. The Core Four white paper includes a framework, actionable ideas and insights from districts who have successfully implemented personalized learning. It can help you get started or take the next step - for your whole district or within your own classroom. Blog: What is the Composition of Personalized Learning? 2- WHAT DOES PERSONALIZED LEARNING LOOK LIKE? Personalized learning is a practice that transforms the teaching experience for teachers and the learning experience for students. But it’s difficult for many to imagine the difference, and before investing time and energy in personalizing learning, a lot of district leaders want to peek at existing PL classrooms. We have a few answers to these questions as there are some standards of practice that can apply to all personalized classrooms, like the Core Four. But the truth is, personalized learning varies from one classroom to another, from school to school and district to district. Instructional models vary to meet the needs of their students, the specificities of their population, etc. Examples: Having said that, here are Six Examples of What Personalized Learning Looks Like. The article includes examples from districts including Loudoun County Public Schools, VA, Rochester School District, NH, Wake County Public School System, NC, and the Enlarged City School District of Middletown, NY. Look-fors: Teachers and school and district leaders also need look-fors, which is why we developed the Core Four Continuum of Personalized Learning. This tool was designed for educators at all levels to self-reflect and set goals across the Core Four. It is also meant to ensure personalized learning is implemented with high fidelity and success. Also, check out this related podcast. Elementary: How might Personalized Learning or the Core Four look in action? Middletown produced several terrific videos of classroom teachers modeling each of the Core Four and discussing how they make these elements come alive. Secondary: And if you are specifically interested in how personalized learning looks like in a secondary school, check out the articles Seeing is Believing: Inside Personalized Learning at Myrtle Beach Middle School and Personalized Learning Instructional Models for Secondary Schools, or view this video case study from Hartford Public Schools, CT.
A report announced by INACOL in 2017, in their blog post What Does Personalized Learning Look Like in Schools?, defines and describes personalized learning and illustrates what personalized learning looks like in practice from student and teacher perspectives at the classroom and instructional levels. It contains a list of real-life examples to help you understand the potential of personalized learning to improve student outcomes, increase opportunity, and address current myths about personalized learning. 3- WHAT IS THE BEST CLASSROOM DESIGN AKA INSTRUCTIONAL MODEL FOR PERSONALIZED LEARNING? This is a question that a lot of teachers and leaders struggle with. And from our perspective, there is no one answer to this question. In fact, the best instructional model for a specific classroom is the one that meets the unique needs and circumstances of those specific students. In this article about how to pick the right instructional model for your classroom, an alumna team member introduces the three base models for personalized learning – station rotation, playlists, and flipped lessons – what they are, and which classrooms they are ideal for from both a teacher’s perspective and a student's perspective. Please note that there are plenty of other models. The ones listed above are fairly common and successful ones, in other words, the need-to-know models. But keep in mind that these models can be layered, modified, and improved, and used at different times within the same class or school. Making the decision around which instructional model is better to use at a classroom level gets much easier for teachers when the district creates alignment across classrooms and schools and guides them with some personalized learning design parameters. School leaders can facilitate this alignment by ensuring teacher autonomy is considered throughout the process of establishing these parameters for personalized learning and creating synergy across classrooms and schools. 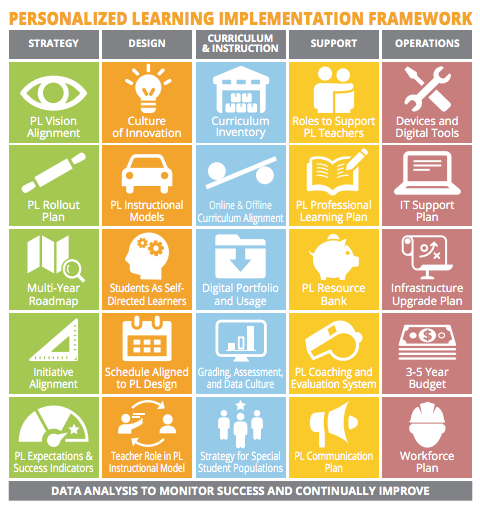 Download the Personalized Learning Design Parameters Guide, or check out this blog post. 4- HOW DOES PERSONALIZED LEARNING ALIGN WITH PROJECT-BASED LEARNING? 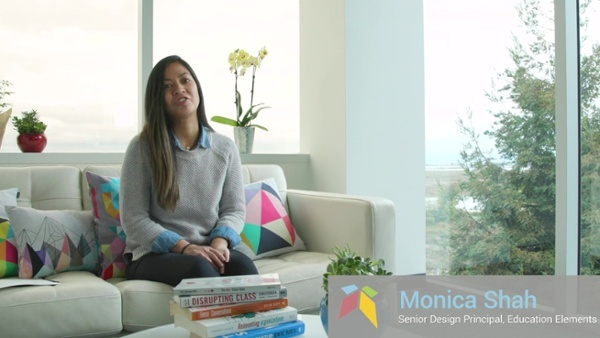 Choose a project that reflects their interests, strengths, and perspectives. Build the knowledge and skills necessary during a sustained inquiry. Receive the feedback and support to produce a quality project. Flexible content and tools build the key knowledge and understanding a student needs for any project. The differentiated path and pace allow all students to engage in sustained inquiry. Targeted instruction facilitates a supportive critique of the project, allows for revision, and provides a structure for teachers to support students with similar interests or knowledge-building need. Reflection supports the inquiry and the student’s ability to choose a challenging problem or question that is meaningful to them. It gives students the tools they need to iterate on their work and seek out support when they need it. Ownership ensures that projects are authentic for all students. Teachers make data-driven decisions that allow them to choose those strategies and instructional models that will ensure all students are building the success skills necessary to produce a quality project. *Underlined text identifies the Essential Project Elements of Project Based Learning, as defined by the Buck Institute. Districts that are using both personalized learning strategies, as well as a project-based learning approach, are able to deeply engage all students in real-world problems with more intentionality and support. These two approaches complement each other because they both build-upon student interests and strengths, and leverage their unique perspectives in critical thinking tasks. The strategies and instructional models captured in the Core Four can allow teachers to ensure that all students can participate in the rigorous inquiry model of project-based learning. LCPS sees personalized learning as a crucial instructional framework to help students engage in “authentic, challenging problems” that lead students to deeper understanding. The district communicates the alignment between PL and the deeper learning initiatives of Project-Based Learning and Performance Assessments in their academic vision and professional learning workshops with Education Elements. As a result, students across the district develop projects that are meaningful and rigorous, and they receive the individual support necessary to be successful. Advice for Teachers and Leaders Combining PL and Project-Based Learning. Students could use a reflection tool to help brainstorm challenging problems and questions that reflect their interests and experiences. This will ensure that students ultimately engage in an authentic learning experience. Teachers could design a playlist that roadmaps the process involved in a sustained inquiry. Flexibility in pace can build student ownership and the roadmap could allow teachers could target support at different points in the process. A station rotation model could be used to allow students to (1) independently research their project topic, (2) share and collaboratively brainstorm ideas with their peers, (3) receive feedback from the teacher in a small group. Teachers could use data to identify the unique needs of all students and tailor the content they engage with. This will ensure that all students can successfully complete a sustained inquiry while being appropriately challenged. Research using reliable digital sources allows each student to build knowledge of their specific project topic. Teachers could guide younger students to specific digital sources and teach older students to properly assess the reliability of sources. School leaders could create the time and space for students to publicly share their projects. This could be at a parent night, in a public and well-trafficked location in the school, and/or celebrated in a school communication tool like a newsletter. Teachers and school leaders could leverage their personal and professional networks to bring in “experts” who could provide additional knowledge for students, give feedback, and even help grade final projects. Blog: Reflections on Personalized Learning and Project-based Learning, on how personalized learning could enhance project-based learning. 5- HOW DOES PERSONALIZED LEARNING ALIGN WITH SOCIAL-EMOTIONAL LEARNING? Self-management: Effectively manage stress, control impulses, and motivate yourself to set and achieve goals. Social awareness: Understand the perspectives of others and empathize with them, including those from diverse backgrounds and cultures. Relationship skills: Communicate clearly, listen well, cooperate with others, resist inappropriate social pressure, negotiate conflict constructively, and seek and offer help when needed. Responsible decision-making: Make constructive choices about personal behavior and social interactions based on ethical standards, safety, and social norms. Each student enters school healthy and learns about and practices a healthy lifestyle. Each student learns in an environment that is physically and emotionally safe for students and adults. Each student is actively engaged in learning and is connected to the school and broader community. Each student has access to personalized learning and is supported by qualified, caring adults. Each student is challenged academically and prepared for success in college or further study and for employment and participation in a global environment. Flexible content and tools ensure that the materials and environment meet students’ social and cultural needs, affording opportunities to build social awareness. Targeted instruction means that students are operating at their zone of proximal development, which supports self-awareness. Intentional grouping by skill level or interest area requires students to collaborate with peers, building their relationship skills. Reflection supports student self-awareness, including recognition of strengths and growth areas. Ownership ensures that students practice self-management; they own their learning by setting and working toward personal and academic goals. Data-driven decisions support the development of a student data culture, providing students an opportunity to use their data to map out next steps in their learning and make responsible decisions. Students could use mindfulness tactics to develop their self-management and take ownership of their learning goals. Teachers could utilize morning meeting structures to support student reflection, ownership, and supportive environment. Students will learn to monitor their personal and academic growth. SEL practices in the classroom and in the school can create a culture of responsiveness among teachers and administrators. A culture of responsiveness is a precondition for sustained change and capacity building. Leaders can offer a Personalized Professional Learning plan to emphasize the implementation of SEL to meet individual student needs in their school. Self-awareness and management through the writing process (planning, revising, editing, rewriting). Responsible decision-making by focusing on Math Practice 1: Make sense of problems and persevere in solving them. Relationship skills by preparing for and participating effectively in a range of conversations and collaborations with diverse partners, building on others’ ideas and expressing their own clearly and persuasively in literacy. You can download this in a one-pager format here. 6- HOW DOES PERSONALIZED LEARNING ALIGN WITH MULTI-TIERED SYSTEM OF SUPPORT (MTSS)? As more districts adopt personalized learning strategies, Education Elements has increasingly been called upon to articulate the alignment between PL and other initiatives in education. This series of briefs seeks to illustrate the role of PL to support, guide, or drive other learning initiatives in ways that are tangible for teachers and leaders. What is personalized learning (PL)? We believe that personalized learning means that students get the core instruction they need, when they need it. The Core Four of Personalized Learning identifies the four major shifts in instruction we would expect to see: the flexible use of online and offline content, targeted instruction, data-driven decisions, and increasing student ownership and reflection. A multi-tiered system of support is a framework that integrates academic interventions and behavioral supports. These interventions and supports are divided between three tiers, often illustrated as a triangle. 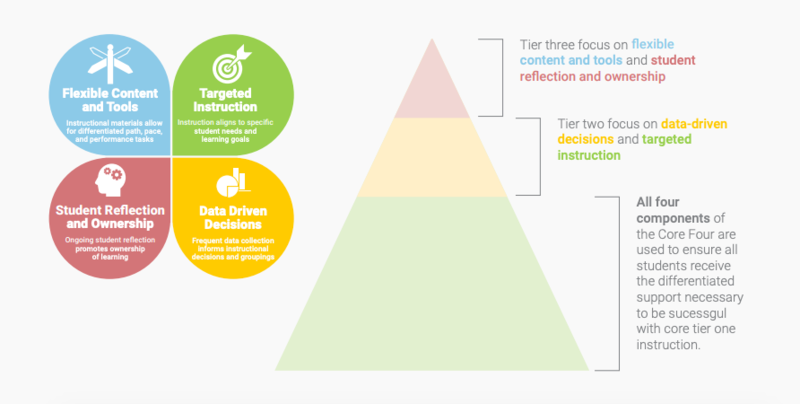 Tier one, at the bottom, represents the core academic and behavioral instruction and supports for all students, and tier three, at the top, are the most intense interventions for the top 5% of students. If MTSS is the model, then PL represents the pieces that fill in that model. Personalized learning is how teachers successfully meet ALL student needs in core instruction. Two Core Four components, data-driven decisions and targeted instruction, explain how schools (1) identify tier two students, (2) provide them with additional support, and (3) monitor their progress. The other Core Four components, flexible content and tools and student reflection and ownership, explain how digital and offline content can provide remediation and help students build their individual agency. Often, successful implementation of MTSS requires districts and schools to be organized responsively. 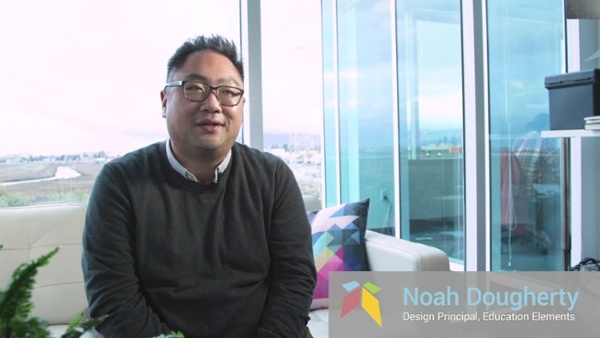 Education Elements CEO, Anthony Kim, wrote The NEW School Rules: 6 Vital Practices for Thriving and Responsive Schools, which describes the six practices that lead to thriving, responsive schools. Teachers may use targeted instruction to ensure below-grade level students get more time with a teacher on grade-level work. Students may engage with a variety of content and tools to practice and demonstrate mastery of grade level standards. For example, a student could practice multiplication on a paper workbook, spatially illustrate multiplication with blocks, and visually on a digital content program. Teachers and schools monitor data and make decisions to ensure all students are getting the differentiated support necessary to be successful with tier one instruction. They also use this to determine if students should receive tier two and three intervention. Increasing opportunities for student reflection is an important component of the behavioral supports required by MTSS. Explicit teaching of positive behavior can also build student ownership. Read more about how PL differentiates tier one instruction for ALL students in our White paper on the Core Four of Personalized Learning. School and district use of data represents how tier two and three interventions are targeted and how those students’ progress is continually monitored for effectiveness. Read more about how Education Elements supports schools and districts to manage change that supports robust student learning. MTSS is one way we provide equitable access to core instruction. Read more about how PL supports educational equity in our blog post. Successful implementation of core instruction required by tier one often requires district adoption of a research-backed curriculum. See the three-phase curriculum selection process that Education Elements has used to help districts ensure that every student interacts with a high-quality curriculum. You can download this content in a one-pager format here. What is the role and function of curriculum and digital content and tools in a personalized learning classroom? How can we create a sense of alignment between online and offline curriculum? Does our current curriculum already work? If not, what needs to change? How can we navigate the hundreds of digital tools available? Who should be included in discussions about curriculum to support personalized learning? At Education Elements, we believe that when it comes to personalized learning, districts need to think differently about curriculum, and that curricular decisions should not be siloed or disjointed. They should align with a widely shared vision and purpose for personalizing instruction. Through our work with over 140 districts we have determined that while curriculum and online content selection can be a challenge, a structured approach makes all the difference. 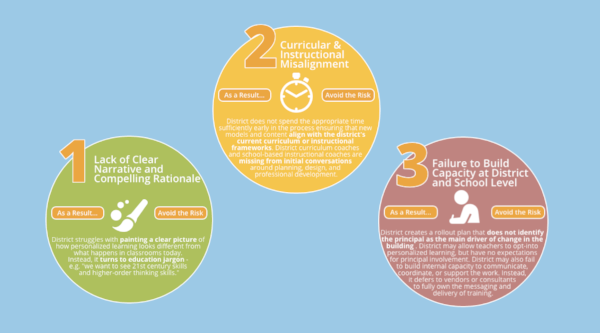 We have identified three phases of curriculum alignment and selection. These phases do not represent a one-time process, but rather an iterative cycle that school and district leaders should follow to ensure that their curricular resources meet the dynamic needs of students, teachers, and the community. 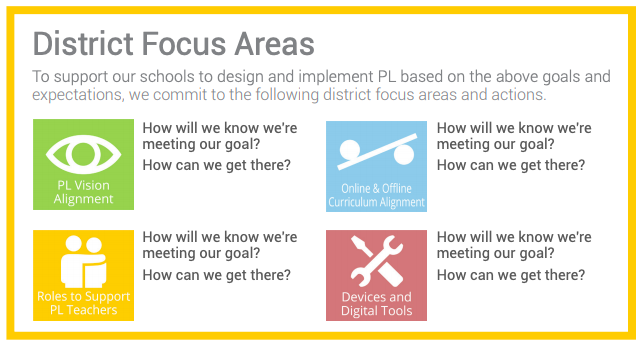 PHASE 1: Align Curriculum Goals with Personalized Learning Vision: A clear vision for personalized learning is an essential first step before any decisions about curriculum, instructional models, support, or professional learning can be made. We recommend that districts identify their needs, vision, and strategy before developing a curriculum plan and digital content portfolio. Vision-setting can take anywhere from a few days to a few months and should include the voice of teachers, students, and school and district administrators. 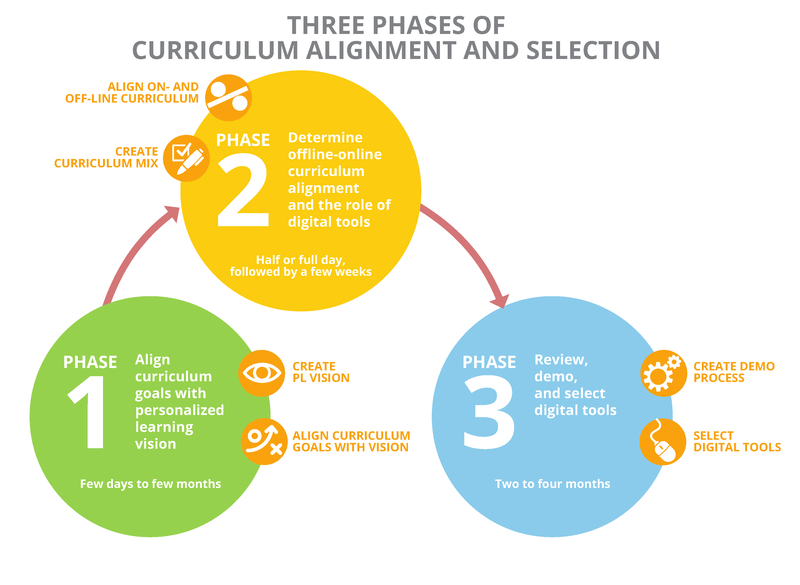 PHASE 2: Determine offline-online curriculum alignment and the role of digital tools: Now that you’ve aligned your curriculum goals with your personalized learning vision, you’re ready to determine your mix of offline and online curriculum tools. We recommend starting with a half- or full-day workshop on curriculum alignment followed by a few weeks of conversations, and including school administrators and teachers in discussions around curriculum needs, though you may host the first workshop with a core district team to start. PHASE 3: Review, demo, and select digital tools: At this point you’re ready to review, demo, and select digital tools. This phase is key to ensuring you get the right tools based on the specific needs of your teachers and students, and that you include key stakeholders in the process. We recommend demoing tools for at least a few weeks and including feedback from students and teachers. From start to finish, the review, demo, and selection of digital tools might take 2-4 months. 2- DO YOU NEED TECHNOLOGY TO PERSONALIZE LEARNING? To be clear, technology serves personalized learning. Personalized learning does not serve technology. Blog: The Technology Trap: Can You Personalize Learning Without Devices? 3- HOW DOES TECHNOLOGY SUPPORT PERSONALIZED LEARNING? Technology supports and amplifies personalized learning in countless ways: it opens up the opportunity for teachers to provide students with immediate feedback within a student’s ZPD; it can create space for more small group tailored lessons; it can reach students who have come of age in a digital world; it can enable students to learn anytime and anywhere; and it can connect students to others. It is a fascinating tool (but not the only one!). Feedback: Proper individualized feedback is critical to maintaining the rate of learning and favorable persistence. Most of the online courses and digital content programs are designed to provide students with immediate feedback and scaffolding. It would be impossible for a teacher to provide the same frequency of feedback to every student on a regular basis. It would be nearly impossible for teachers to create individualized quizzes for each student based on where they are in their learning progression. Small Group Formation: Teachers use a variety of formative assessment data to determine small groups. One source of this data can be through the use of technology; do students need additional time on a particular standard or concept, or is there a group ready for acceleration? Collaboration: Many of us have tried collaborating on handwritten essays. We would send back and forth versions with notes and comments, but it can be cumbersome, time-consuming, and make collaboration challenging. Products which have a social aspect or sophisticated collaboration capabilities like Google Docs allow multiple authors to work on the same document at the same time, and writing, editing, and commenting can happen in real time and in the moment from teacher to student, and student to student. Creation: The barrier to entry to create anything is very low today. You can create and publish a movie on YouTube using your phone. You can publish a book in days online using Amazon, Blurb, or BookBaby, among many other services. Instead of die-casting a mold using machinery, a 3D printer can build a part within hours. Even an internet software company can be started on a shoestring; in 2000, the average startup cost was $5 million, and in 2011 it was $5,000 due to cloud computing. When used properly, new digital tools give us a unique opportunity to demonstrate our creations more frequently and easily. In a variety of ways, technology holds promise to enable personalization to an extent that was not possible at a large scale in an earlier era. 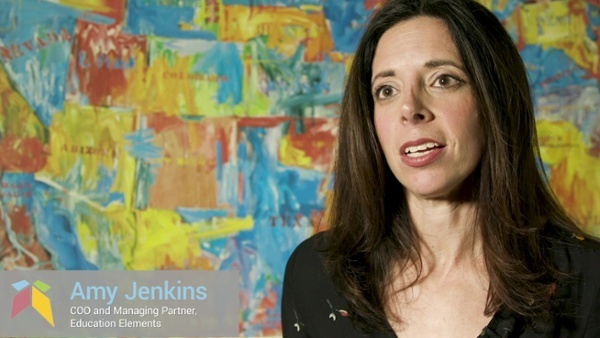 Technology’s greatest role may be to manage the complexity of the personalization process. By occasionally providing instruction or supporting independent learning, technology can also enable educators to take a more personalized approach in their own teaching efforts and other activities they undertake to support student learning and development. 4- WILL PERSONALIZED LEARNING TECHNOLOGY REPLACE THE ROLE OF THE TEACHER? Personalized learning redefines the teacher’s role but does not replace teachers. The transition from a classic educational model to a personalized learning one isn’t an easy shift for teachers. It’s a departure from the familiar – the setting can be a new, physically different one; there can be changes in their roles and responsibilities. Technology is not being introduced to replace teachers, as some might assume. In fact, while technology is a great way to offer more to students (e.g. through adaptive content), it still has limitations. No matter how “smart” a product or computer program is, it can’t compare to the knowledge, life experience, and community that a teacher brings into the classroom. Computers can’t create relationships with students. Programs can’t connect learning to their lives the way a teacher who knows her students can. In our experience, personalized learning amplifies the role of the teacher. Consider Bloom’s Taxonomy. Technology is great for the bottom of the pyramid – for things like understanding and remembering. And while it can certainly play a role at the top, its introduction to the classroom often frees up the time of the teacher to focus on things like applying, creating, and synthesizing. 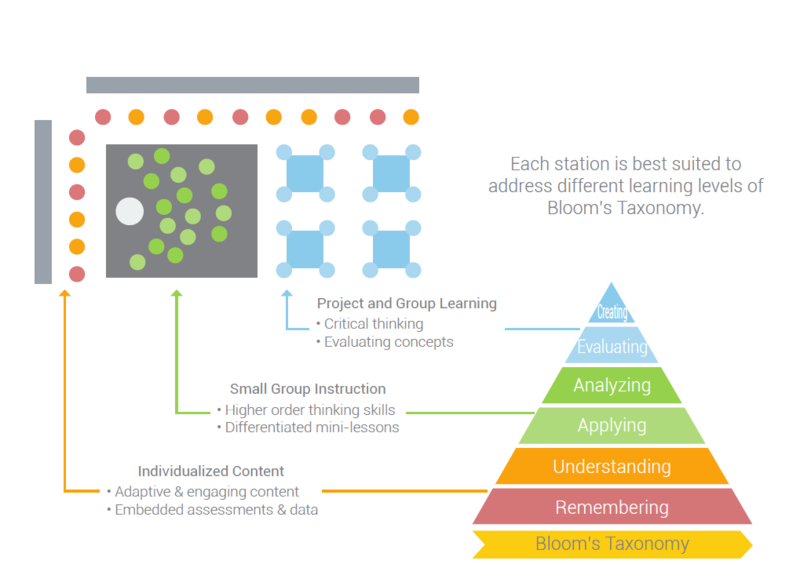 In the diagram below, we model out how a 3 station rotation model maps to Bloom’s Taxonomy and elevates the role of the teacher to focusing on higher order tasks and critical thinking. It is hard to emphasize enough that technology should not replace teachers and that personalized learning should not either. The “personal” element of personalized learning really has more to do with people than it will ever have to do with devices. Contact us to learn about how we can help you design and implement personalized learning for your district. School districts that develop thoughtful communications plans do more than just push important information out to their stakeholders. These districts build a culture of engagement, transparency, and trust that is critical for innovation to both take hold in the classroom and be sustainable and scalable across many schools. Poor communication can lead to unmanageable expectations, confusion, and opposition to change. If you are like most districts, you have many different priorities to juggle. There is a real risk that introducing personalized learning will be seen as “just another initiative,” and therefore will be received with confusion, apathy, or derision. Take time to think about all the messages you are sending to your teachers, families, and community members. How do blended and personalized learning align to, and complement, these initiatives? How does everything fit together to accomplish your district’s strategic plan or vision? Keep in mind that your efforts should not move in only one direction, from you to your audiences. Work to create two-way conversations that build true engagement with your stakeholders. Education Elements, in collaboration with The Learning Accelerator, a national nonprofit and a catalyst to accelerate the implementation of high-quality blended learning across the U.S., developed a personalized learning communications guide entitled Communications Planning for Innovation in Education: How to communicate about your blended & personalized learning initiatives. It is a guide to creating informed conversations and preventing miscommunicating about personalized learning. The paper streamlines the planning process and clearly lays out the key steps for effective communications planning for those just beginning their journey, as well as practitioners who have been implementing for several years. Whether you are just beginning to embrace innovation in your school, or if you have already begun a personalized or blended learning initiative, taking the time to systematically plan your communications strategy and align it to your student learning goals is absolutely critical. Assess your district’s communications capacity and identify existing communications resources, as well as gaps in your capabilities and/or expertise. This process can be as deeply thorough or as high-level as you have time for, but the important step is to know what communications tools and resources you have at your disposal to execute your communications plan. Phase 3 is the core of your communications planning effort and includes identifying your key audiences, determining the best messengers for reaching your audiences, drafting targeted messages, and deciding on the tactics to deliver those messages. We’ve developed a Blended & Personalized Learning Communications Planning Worksheet (see page 28 of the guide) to help guide you through these steps and we discuss each element in this section. How you determine if your communications efforts are succeeding depends on what goals you set in your strategy. If parent or community awareness was a goal, consider doing a survey at the beginning of your implementation efforts and again periodically thereafter to gauge effectiveness. Similarly, a teacher “listening tour” at the beginning and mid-way points of your implementation efforts can highlight communications successes or problems. Download the guide for a detailed plan. Throughout the guide, you can find short profiles of districts that have partnered with Education Elements and are at various stages of this work. Successful communications is an ongoing effort, with many small wins as well as big ones, and invariably a few missteps too. We encourage you to use this guide to customize a communications strategy for the unique needs of your district. Effective communication is a cornerstone of successful innovation in education. 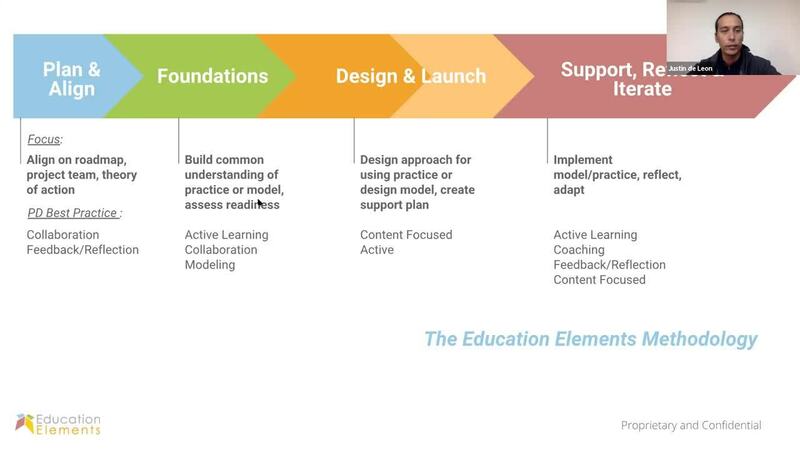 Education Elements and The Learning Accelerator have been deeply involved in the work of blended and personalized learning from early on, as implementation experts and catalysts. Together, we have created this new personalized learning communications guide. The lack of understanding, alongside a lack of knowledge of the benefits of personalized learning, remains a consistent barrier to large-scale systemic change and support. It is of critical importance that you are able to effectively communicate your vision and plan not only to educators (which is hard enough) but also to families, in ways less steeped in education jargon and practices. Districts need a strong culture of communications to be able to get buy-in from families and stakeholders. It’s not just about getting the information out there, but about getting the right message with the right verbiage and the right tone. Districts have to talk to families about personalized learning in a way that ensures the community can see the vision, the need for change, and ultimately champion the idea of personalizing learning for students. Our partner, ExcelinEd, an organization that supports state leaders in transforming education to unlock opportunity and lifelong success for each and every child, conducted a national survey of 800 voters to gauge their understanding of personalized learning and why it might or might not interest them. In response to the learnings that came out of this survey, Ed Elements provided district leaders with a guide on how to talk about personalized learning in a way that all stakeholders can see the vision and the need for change. The white paper: Communicating Personalized Learning to Families and Stakeholders: Terminology, Tools and Tips for Success provides readers with engaging messaging, outlines the best messengers, shares real-world examples, and provides a set of lessons learned. To learn more from the authors of these resources, check out this podcast on Strategic Communication for Families & Stakeholders, by the Principal Center Radio. 1- HOW TO MEASURE THE SUCCESS OF PERSONALIZED LEARNING? When it comes to personalized learning, people are understandably apprehensive about how to measure its impact. After years of thinking of students as either “proficient” or “not proficient,” many still reach for end-of-year summative data. How did our students perform on academic indicators, such as state or nationally normed tests? While end-of-year measures are important, they can falsely imply a binary outcome: you are either successful or you are not. Meanwhile, growth in academic skills, relationships with students, and innovative teaching techniques all develop week-to-week in classrooms and risk going undiscovered. To students, parents, and teachers, these may be the “measures that matter most,” as NGLC points out in its 2016 report of the same name, and on their website that showcases the various approaches and tools districts are using to measure success. Bearing all of this in mind, we’ve made a similar pivot in how we think about measuring success. While we continue to look at student achievement on nationally or regionally normed assessments, we are also focusing on helping our districts and schools take a more proactive approach. We’ve started to frame the conversation as “charting your course.” That phrase implies a journey and aligns with our belief in design thinking – it is imperative to set a vision for your district or school, to not be afraid of failing fast, and to constantly iterate your approach in service of that vision. District and school teams that chart their course must rely on indicators throughout the year or risk losing their way. It’s all part of a personalized learning mindset in which constant learning and creative response are expectations for all stakeholders, from students to superintendents. What might this look like in practice? Check out the full article on Charting the Course in Personalized Learning for examples from a few of our schools and districts that have used short-term measures to chart their course. We would never argue that a district or school shouldn’t be focused on end-of-year outcomes, but we’re suggesting that districts and schools that only focus on these measures miss an opportunity – they are less able to course correct, if necessary. They also are less able to identify early proof points of success – such as teachers or schools that are doing amazing things – that can be used to create enthusiasm for the work. Report: Measures that Matter Most: How Do Next Generation Educators Measure Success? 2- DOES PERSONALIZED LEARNING WORK? HOW DO I KNOW IF PERSONALIZED LEARNING IS WORKING FOR MY DISTRICT? We are often asked, “Does personalized learning work?” That’s an urgent question that we take very seriously. Since 2010, we've worked with more than 40,000 teachers, 750 schools and 140 districts across the nation, to personalize learning and improve learning for over 630,000 students. Each school year since 2014-2015, we have released an annual report on how our personalized learning work impacts districts, schools, teachers, and students. Our findings each year have been positive, and we are thrilled to say that after five years of reports, we continue to see the cumulative benefit of personalized learning over time, and that is reflected in our reports shared below. The Enlarged City School District of Middletown, NY saw sustained academic growth year after year. This year, 57% of Middletown students in grades K-8 tested proficient in ELA, up from 40% five years ago and 62% tested proficient in math, up from 44% five years ago. At Rochester School Department, NH, 83% of school leaders report that students are more engaged since starting personalized learning. In Minnesota, District 197’s pilot of personalized learning with the “Vanguard” teachers was very successful. Survey results show that 90% of Vanguard teachers feel more effective since implementing personalized learning and Vanguard teachers also report higher student engagement and more students passing their classes. Access the full 2017-2018 report for details. We continue to see the cumulative benefit of personalized learning over time. In the Enlarged City School District of Middletown, NY, 65% of all Middletown K-8 students hit their reading growth targets, an increase of 21% since 2013-2014; 67% hit their math growth targets, an increase of 23%. In Horry County Schools, SC, 57% of grade 6-8 students hit reading growth targets, an increase of 7% since 2013-2014; 64% hit math growth targets, an increase of 17%. In Piedmont City School District, AL, 72% of students in grades 3-8 tested on target in reading on the ACT compared to 28% in 2014-2015, and 55% tested on target in math compared to 35% in 2014-2015. Across our district partners, leaders are seeing changes in teacher practice and student engagement. Since their districts started personalized learning, 92% of district leaders say that teachers are more effective and 90% say that students are more engaged in their learning. Access the full 2016-2017 report for details. An analysis of 17,000 students in districts that worked with us showed 142% growth in reading and 121% growth in math on the NWEA MAP exam, compared to national norms. The Enlarged City School District of Middletown, NY, completed their third year of personalized learning. Compared to their first year of personalized learning in SY 2013-2014, Middletown saw 33% more students achieve their growth targets in reading and a 39% more in math. We surveyed 168 school and district leaders across 11 districts: 85% of district leaders said that students are more engaged in class and 75% of school leaders said that students are taking more ownership of their learning since implementing personalized learning. A snapshot of this report is available on the blog post A Year of Personalized Learning: 3 Things You Need to Know. Also, explore an article by Michael B. Horn, Education Elements Gets Results, on the impressive personalized learning outcomes of this school year. Personalized learning impacts student achievement on nationally normed tests: students in personalized learning classrooms showed 135% growth in reading exams and 119% growth in math (compared to the national norms of NWEA). Personalized learning makes meeting the needs of students easier: 100% of district and school leaders and 95% of teachers agree that personalized learning enables teachers to provide more differentiated instruction. When it comes to personalized learning, it doesn't matter if a district is just getting started, or has been on the journey for years – there comes a time when each district and school leader starts asking the following questions. “How do I know if my school or district implementation of personalized learning is on track?”, “How can I assess the quality of my implementation?”, or “How does my district’s implementation compare to other districts?” Considering how much change a district can experience, and the level of investment of both time and money it requires, it makes sense that you want to know: is this working? What should I do next? How do you know how you compare? The answer is to see how you compare against a national benchmark. Our team of former educators and administrators works side-by-side with districts to personalize learning. And for 8 years, we have been working with districts to build and support dynamic school systems that meet the needs of every learner, today and tomorrow. Through our experience with over 140 school districts across the country, we have developed Onpoint, a personalized learning benchmark score, as a single number score that gauges school and district implementations of personalized learning. It helps district leaders track their implementation progress and narrow their focus for future investments of time and resources. Onpoint combines expert assessment from Education Elements consultants with teacher and leader survey results to arrive at a single number score, which can range from 200 to 1,000. The score has seven components, aligned with our Personalized Learning Implementation Framework. The Onpoint report includes feedback on multiple components of a personalized learning implementation, alongside a set of recommendations, so that school and district leaders can focus their efforts to improve individualized instruction. By comparing your district’s Onpoint score to a benchmark derived from a growing dataset of school districts and thousands of survey responses, you can measure your progress and identify where to start or continue your work to implement personalized learning for all students. Track the progress of your personalized learning implementation by requesting your districts Onpoint report. Since 2010, we've worked with more than 750 schools and 140 districts across the nation to personalize learning. We are so grateful to have the chance to work with so many districts and look forward to many years of working with many more. Throughout our work implementing personalized learning, we’ve worked with a wide array of districts and schools. Each district has their own unique strengths, challenges, and goals, but they all share a common commitment to personalize learning for every student. We are immensely proud of two of our earliest districts, Enlarged City School District of Middletown, NY, and Horry County Schools, SC. These two districts are pioneers in personalized learning. Both Middletown and Horry started their journey more than five years ago. We’re so pleased to share on their behalf that for the fifth year in a row, more students in the Enlarged City School District of Middletown, NY, and Horry County Schools, SC, are meeting or exceeding nationally normed growth targets, and both districts have shown the cumulative benefits of consecutive years of personalized instruction. Despite outperforming most districts in the state, Horry County Schools (HCS) realized they could do more to raise academic achievement for all students. We started our work with HCS by developing a personalized learning instructional model and support plan for one pilot middle school. That led to creating a strategy and supporting the design, implementation, and rollout of PL across the district. Watch their story. Although small for a city district, the majority of students come from poverty and Middletown wanted to close the achievement gap between white and minority students, as well as lower their dropout rate. Education Elements started working with them in 2013, and over five years, we have transformed the district together. Discover their story. Despite facing the unique challenges of being an isolated, rural community, the Fairbanks North Star Borough School District in Alaska committed themselves to bridge the gap for their students. Education Elements worked with the district to win community support, empower teachers, and prepare students for 21st-century technology and careers. 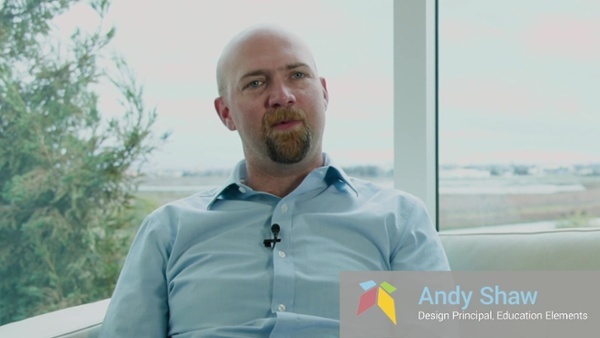 Check out their case study. As the 15th largest district in the country, Wake County Public School System (WCPSS) was faced with keeping up with the demands of a rapidly growing population. 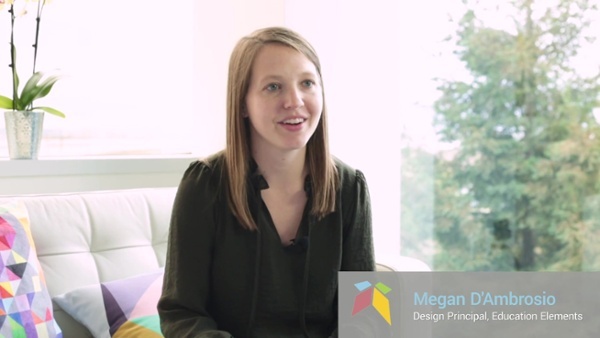 WCPSS worked with Education Elements to design a new “personalized learning school” from the ground up, with a fresh approach to traditional structures and processes along the way. Watch their story. The Wayne-Finger Lakes BOCES is a unique model in which many school districts work with both Education Elements and each other to rethink their instructional models while meeting the varying needs of each district. The districts demonstrated a high level of cross-collaboration, combined with direct support from Education Elements, to revitalize teaching and learning. Check out their story. Hartford Public Schools in Connecticut knew that the primary roadblock to their students’ success was a high poverty rate and large opportunity gap. The district worked with Education Elements to introduce blended learning into their high schools, which provide targeted career preparation and opportunities and focused on professional development for teachers. See the whole case study. Loudoun County Public Schools is determined to prepare students to be successful in a global work environment. Through supporting them in aligning project-based learning and personalized learning, and developing a strategy for OER, we are helping them get students ready for the future. Watch their story. Racine Unified School District was experiencing declining enrollment, especially at the middle school level, due to economic conditions and state policies which allow students to transfer in and out of districts. Education Elements worked with the five middle schools to turn them into places where parents and families are confident their students are central to the learning environment. See their story. In 2014, Uinta County School District #1 knew that they wanted to do more to support student-centered learning but did not know where to start. Since then we have worked with them to support school teams as they design classrooms where the experience is personalized for every student. See the whole case study. Warren knew they were not getting a return on investment from their technology. Education Elements helped them to reset and focus on their vision of personalized learning to then leverage their devices effectively. Discover their story. Syracuse wanted to improve student achievement and engagement along with supporting social-emotional learning. Education Elements helped them to align their initiatives, anchor on personalized learning, and create classrooms where students have all of the support they need to succeed. Watch their story. Fulton had a vision for personalized learning but needed help to implement it. Over two years, Education Elements supported 95 schools in designing and implementing new personalized learning instructional models. See the whole case study. When Yuma decided to implement personalized learning, they decided to go big and launched in all 17 schools in their district at the same time. 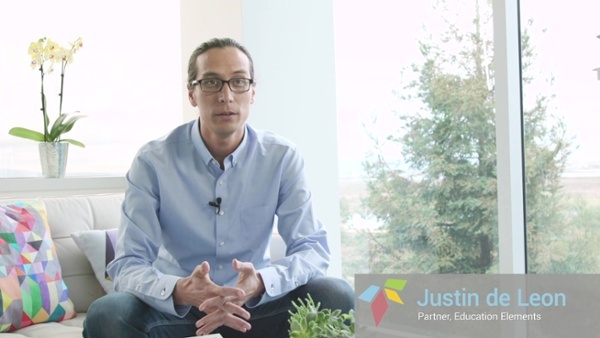 With our support, they designed and implemented personalized learning successfully in all their schools, with an eye on continuous improvement and a passion for doing what is best for every student in their district. See their story. Ready to Implement Personalized Learning But Don't Know Where to Start? We respond to requests immediately, so we’ll get back to you super fast to set up a time to chat. Want us to email you a copy?